Greece is one of those travel destinations that ticks many boxes in my book…I love Mediterranean food and I’m quite happy to eat grilled fish, fresh salads with feta cheese and eggplants at each meal providing I don’t have to cook. 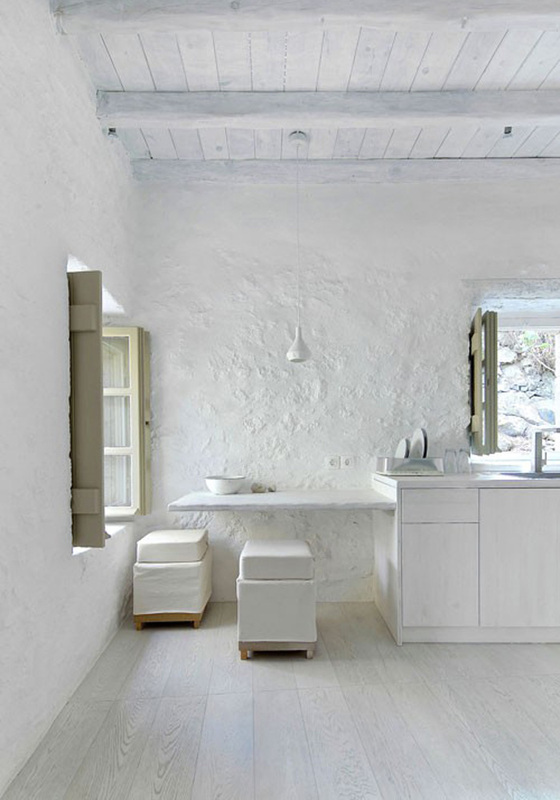 The landscape in Greece is also very beautiful and as a white interiors lover, those little white houses with gorgeous blue accents scream Summer to me. 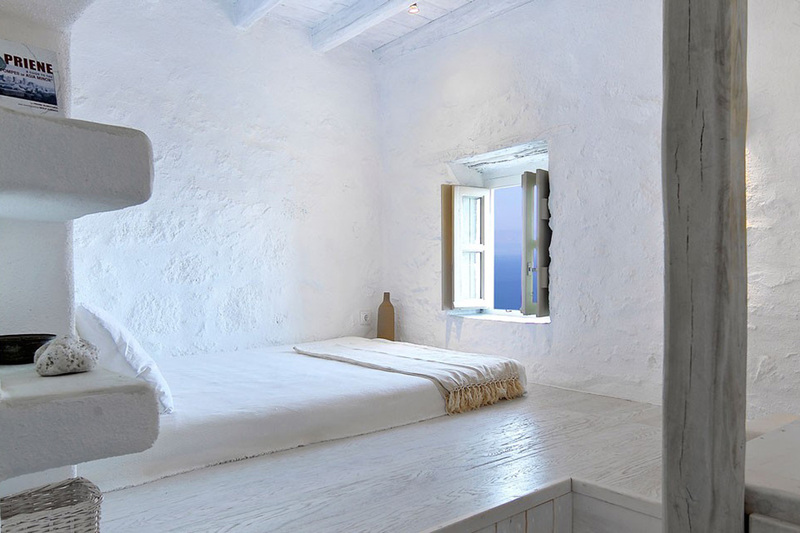 Greece is also still reasonably affordable as a holiday destination. 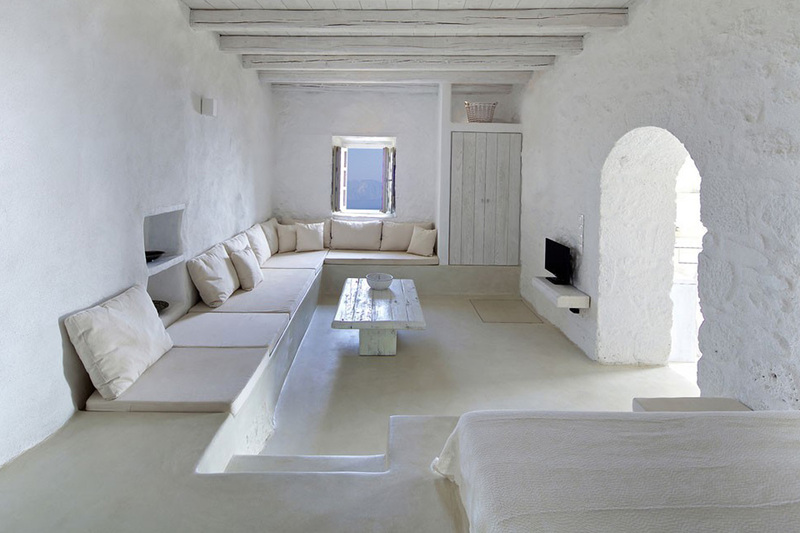 This home, located in Nisyros, a small volcanic Greek island located in the Aegean Sea between Kos and Tilos was built in 1850. 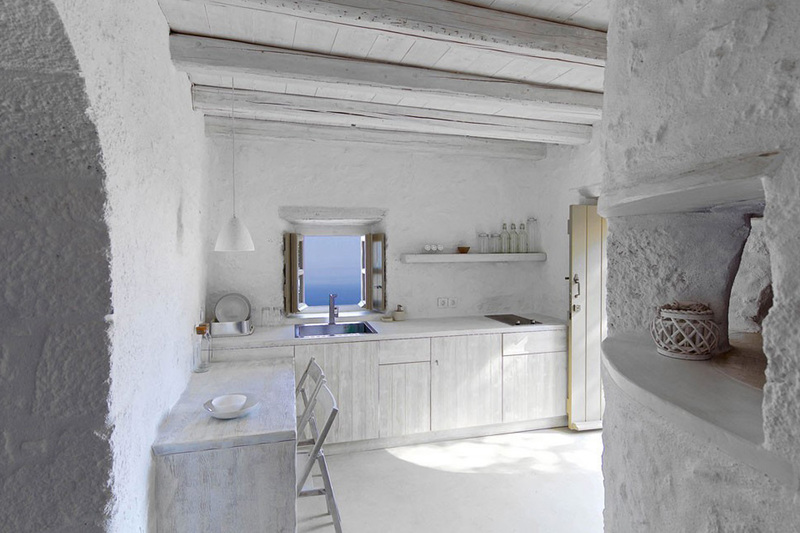 Recently converted into two independent luxury apartments, it was restored by ADarchitects using only eco-friendly primary materials such as the local black volcanic stone of the island, that gives the house its special character. 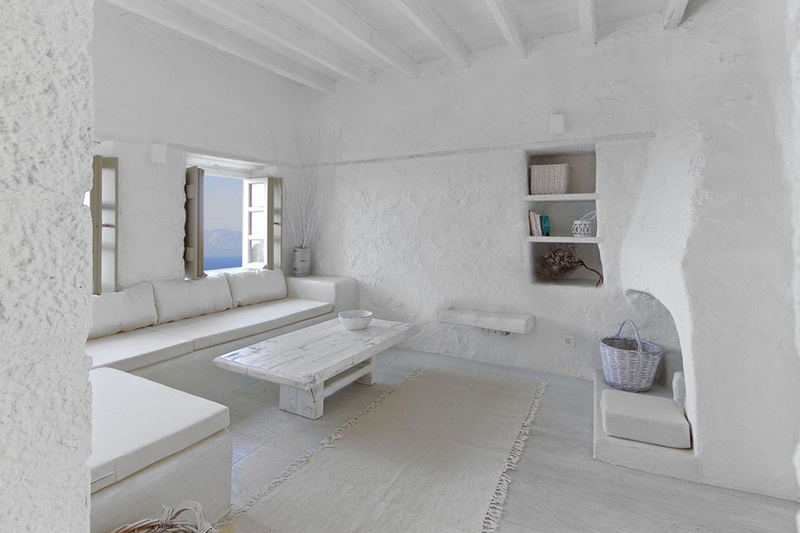 White on white looks always stylish, clean and inviting which is always a great thing for a holiday home. The kitchen combines modern, clean lines with rustic touches. Playing smooth materials against finishes with more textures as seen here with the pendant light and the rustic white painted wall as a background, is always a recipe for success. White ceramic or bone china pendant lights are also great timeless, investment pieces. I hung a mix of pendant lights by Kathleen Hills in our holidays home in France over ten years ago and they are still looking incredibly modern. 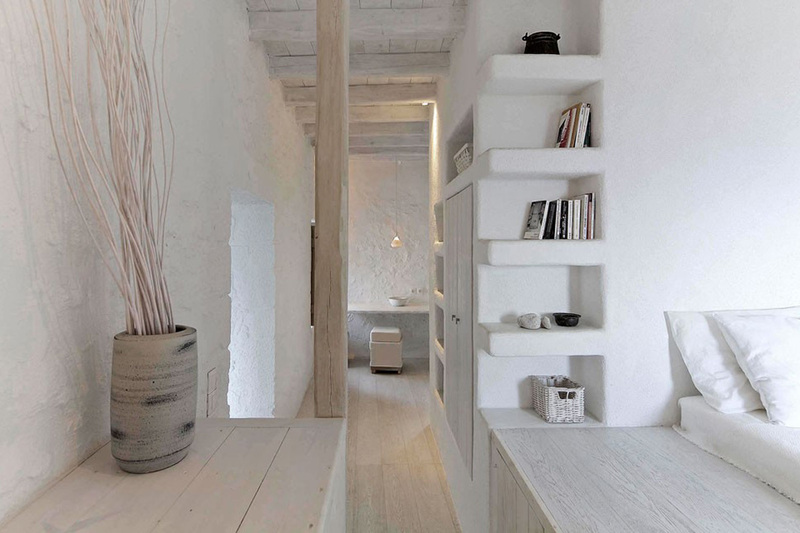 Uncluttered, minimalist, the simplicity of the design and the purity of forms and volumes are in harmony and brings a feeling of calm.Small white spaces are highlighted by laid-out levels with built-in furniture and modern equipment. From the rug to the basket and cushions, everything has been chosen to be discreet and natural, like the perfect canvas for your holidays. The great thing is that I managed to find this beautiful apartment on Airbnb and their website to book it directly. It only fits two people but they have another one available here if you are travelling with another couple. Thanks for sharing Karine! <3 This is just perfect! Beautiful! 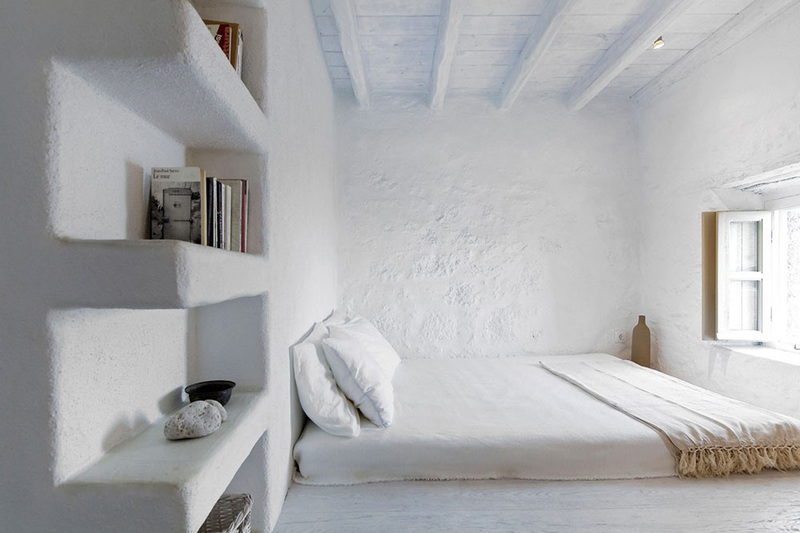 For being such a stark white, there is still such a warmth to the rooms, and the natural accents add such an inviting ambiance to it all. What a lovely little house. Thanks so much for sharing! Whoa! Now this is something else! I wouldn’t live here but to experience this as a vacation would be fantastic. 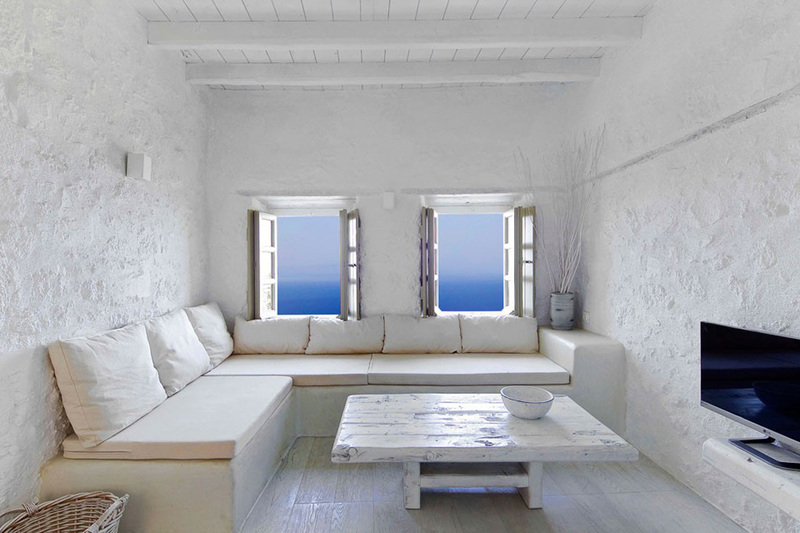 Greece is a lovely country and this white apartment overlooking the blue sea is just breathtaking.